For four years early in his career, Paul Rudolph collaborated with Ralph Twitchell, producing many designs including the Cocoon House. 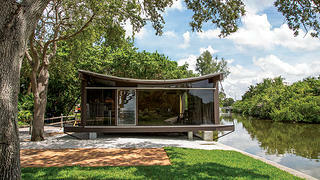 With its Modernist floor plan and experimental, climate-appropriate cypress jalousie walls, the Cocoon House on Siesta Key in Sarasota, Florida, remains a distinctive example of the Sarasota School of Architecture. When the 1950 guest house was placed on the rental market in February of 2018, the Sarasota Architectural Foundation (SAF) leaped at the opportunity to obtain a lease and open it to the public for tours to celebrate architect Paul Rudolph’s 100th birthday. Designed by Rudolph and Ralph Twitchell, the approximately 750-square-foot house owes its name to the spray-on vinyl compound used as its original roofing material, developed by the U.S. military to protect ship parts from the weather. The city of Sarasota designated the Cocoon House (also known as the Healy Guest House) a historic property in 1985, protecting it from future threats. Upon signing the lease, the SAF began restoring and repairing the structure with the help of architect and author Joseph King. They removed non-historic paint layers from its 420 jalousie slats and other wood components, rebuilt its front porch and balcony, and added period-appropriate furnishings. Tours ran through December, and may continue in 2019. “It perfectly fits our mission to educate about, advocate for, and celebrate the Sarasota School of Architecture,” says Christopher Wilson, chairman of the SAF.